Man in tank top with overalls bobblehead, personalized head from your photos. This bobblehead is dressed in white jeans with a yellow tank top and red overalls. This will make a humorous and creative gift for any special occasion. Man with arms behind his back bobblehead, personalized head from your photos. Dressed in business casual with his arms behind his back, this is a truly unique gift for the casual, yet cool friend or co-worker. Man with angel wings bobblehead, personalized head from your photos. 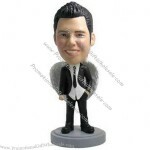 Dressed in a shirt and tie with wings on his back, this bobblehead is a unique item for your special angel. Whether to celebrate his angelic spirit or to mock a friend who may have more of a devilish side, this makes the perfect gift. Chef with arms crossed bobblehead, personalized head from your photos. This bobblehead dressed as a professional chef is the perfect gift for the true chef or culimary guru. 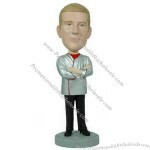 Wearing a chef's jacket and with arms crossed, this bobblehead is the perfect gift for the man in charge in the kitchen. 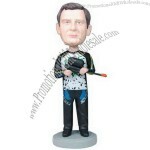 Paintball player bobblehead, personalized head from your photos. This is the perfect gift for the male paintball enthusiast, featuring paint splattered clothing and a paintball gun. 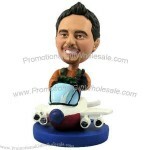 Pilot in plane bobblehead, personalized head from your photos. For any pilot who loves the rush of flying a plane, this bobblehead makes an ideal gift. Surprise him with your creativity, and he will always be reminded of his time in the clouds. 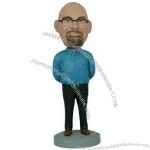 Videographer with camera bobblehead, personalized head from your photos. 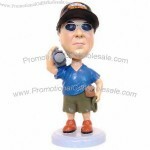 Holding his camera on his shoulder, this bobblehead gift will surprise and please any Occupation or amateur videographer. If he loves to capture important events on tape, this one of a kind gift will always remind him of his passionate hobby or profession. 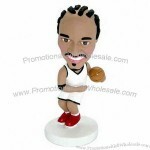 Basketball dribbler bobblehead, personalized head from your photos. For the basketball player with a killer crossover, this dribbling ball player is an ideal gift. Any player or sports fan will admire your creativity with this one of a kind gift. Female fishing bobblehead, personalized head from your photos. This is the perfect gift for the woman who loves fishing. This female bobblehead is dressed casually and is holding a fishing pole with two fish included on the base. 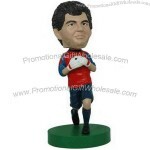 Soccer goalie bobblehead, personalized head from your photos. This is the perfect gift for any soccer goalie or former soccer star. Our add on options even allow for further customization including team colors, logo, and number. 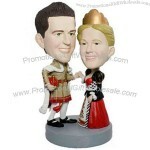 Royal wedding bobblehead personalized head from your photos. This bride and groom are holding hands and dressed as royalty. This is a unique and special gift for the elegant couple. Dancer bobblehead, personalized head from your photos. 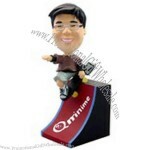 Skater bobblehead, personalized head from your photos. Looking to surprise your favorite skateboarder? Customize this bobblehead, and it makes a one of a kind gift that will entertain any skateboarding enthusiast. 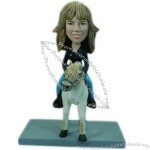 Woman on a horse bobblehead, personalized head from your photos. Female in black shirt and red pants bobblehead, personalized head from your photos. 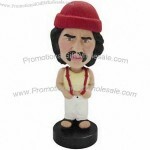 Casually dressed in a black tank top and red pants, this bobblehead is the ideal gift for the sporty woman in your life. She will be amazed by your creativity and impressed by your thoughtfulness. 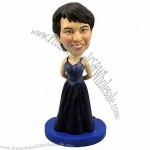 Woman in evening dress bobblehead, personalized head from your photos. Surprise the sophisticated woman in your life with this bobblehead dressed for a night out on the town. If she enjoys looking stylish and classy, she will enjoy this gift even more. 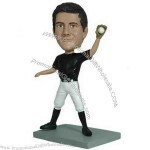 Baseball player making the catch bobblehead, personalized head from your photos. This is the perfect gift for the baseball player who always makes the impossible catches. Our add on options allow you to further customize this bobblehead specific team colors, team logo, and even a number for the jersey. 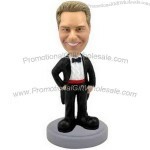 Man in tuxedo bobblehead, personalized head from your photos. 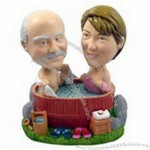 Couple in a hot tub bobblehead, personalized head from your photos. This couple in a hot tub makes a perfect gift for any romantic and fun loving couple. Customize this bobblehead, and the recipients of this gift will be entertained by it for years to come. 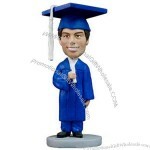 Male graduate in blue gown bobblehead, personalized head from your photos. Dressed in a blue cap and gown, this bobblehead is the ideal gift for any graduate. Celebrate his proud moment with this unique item, and it will forever remind him of his great accomplishment. Custom-made Arts Crafts From China Factory, Low price Arts Crafts, Top Quality, True wholesale source for original!